Feline Immunodeficiency Virus (FIV) attacks and weakens the immune system, making our furry friends more susceptible to other common diseases. The most common way for a cat to get FIV is via deep bite wounds from other cats that already have the disease (i.e. FIV-positive cats). FIV is unlikely to spread between cats in casual, non-aggressive contact e.g. grooming, sharing bowls, or play fighting between cats within the same household. 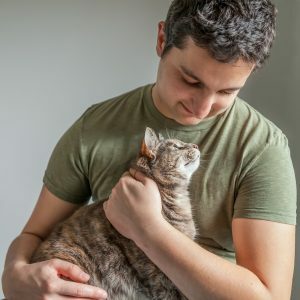 We know that male undesexed cats with outdoor access are most likely to contract FIV because of their tendency to get into fights that result in bite wounds. Much less commonly, the virus can be transmitted from a FIV-positive mother cat to their kittens through the uterus and the milk. But how do you know if your cat has FIV? An in-house blood test can be done to detect if your cat has been exposed to the virus. This test detects the body’s response to exposure, which is measured by antibody levels. If you are concerned your cat has been exposed to FIV, we recommend testing 60 days after the “exposure event” (e.g. cat fight) as it takes a few weeks for antibodies to develop. If your cat tests negative and you want to reduce their risk of getting FIV, Uni Vets Camden recommends vaccination against FIV. FIV-negative cats require an initial course of three vaccinations, 2-4 weeks apart followed by yearly boosters. Kittens less than 6 months old can start straight onto a vaccination program without testing.